They do say all eyes should be on the bride! 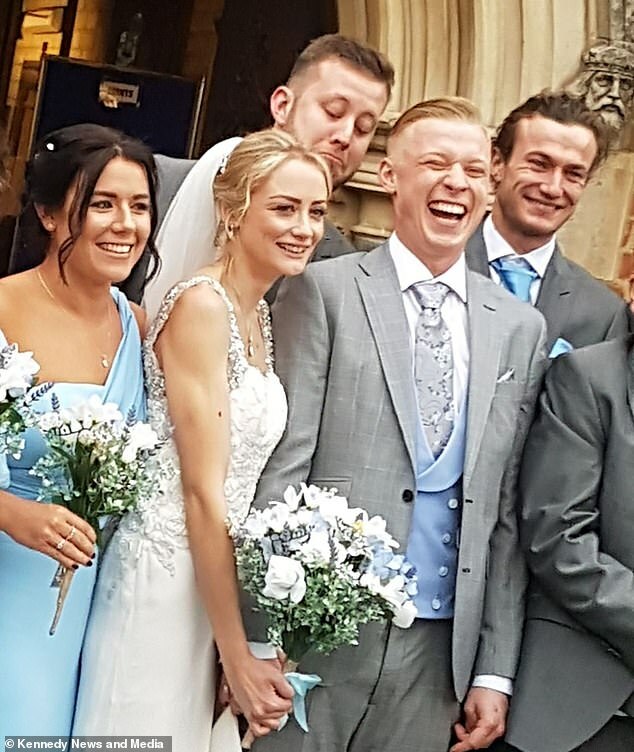 Cheeky usher is caught checking out his best friend’s new wife in wedding shoot – and then gets a telling off from the groom! 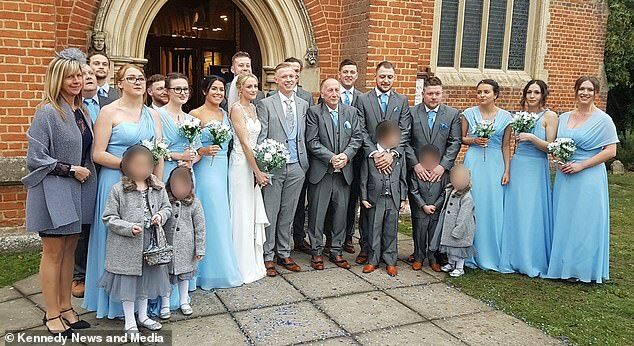 It’s said all eyes should be on the bride at a wedding but one cheeky groomsman took that tradition a little too far at his childhood friend’s nuptials. 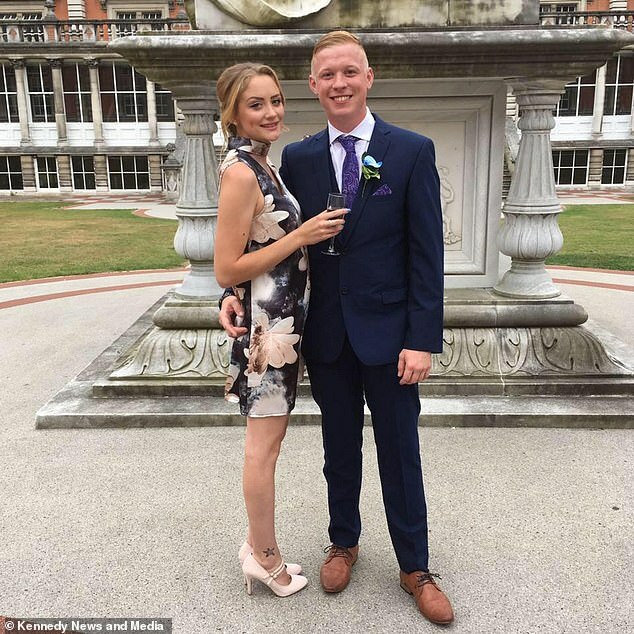 Prankster Andy Wills, 25, was caught on camera peering down Natalie Couldrey’s wedding dress as he stood behind her while posing for photos. 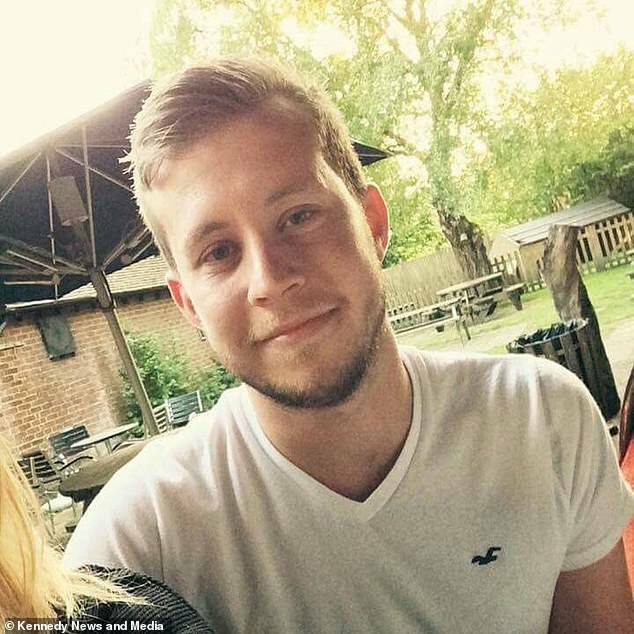 The newlywed, 25, and her husband Rhys, 27, had no idea what happened until they saw the picture later that night. Luckly for Mr Wills, the couple saw the funny side of the risky joke. The usher has since revealed they have even agreed to include the snap in their official wedding album. Mr Wills, from Farnborough, Hampshire, said: ‘At that point they had no idea what I was doing until they saw the picture later that night. ‘Rhys called me an a***hole to be honest. I thought it’d be quite funny. ‘Me and Natalie get on really well so she knows what I’m like – it was a bit of a joke. The usher admitted he’d ‘had a few beers’ and decided he would try to make the photographer laugh, if not the newly-weds. During the photo-shoot, the rest of the group posed dutifully, oblivious to Mr Wills’s wandering eye. He added: ‘I thought I’d make it look like I was checking out the bride. ‘I’d had a few beers by then and thought it’d be a funny prank. I did it on purpose to wind them all up. ‘We’d just come out of the ceremony and the photographer was getting pictures of all the wedding group. ‘I thought it’d get a few laughs afterwards, but I’m not entirely sure anyone noticed at the time. Mrs Couldrey, also from Farnborough, said: ‘I think I’ll be putting this one in our wedding album because it shows the how cheeky the lot of them are. ‘I love that about them – it also shows that the wedding was fun. ‘This is a very Andy thing to do. He’s always been a prankster, he’s got a good sense of humour… most of the time. ‘I had no idea what he was doing while we were all posing – I only knew about it later on that evening when they showed me.